Hippocrates, the “Father of Medicine” who lived around 350 B.C., recommended boiling water to filter out impurities – those particles that pollute its sweet taste, mar its clarity or poison the palate. He was onto something, but his advice pertained only to what the observer could taste, touch, smell or see with the naked eye. The “what you see is what you get” approach was about the extent of scientific water analysis until the late 1800s. That invisible organisms also thrive and swim around in a watery environment was beyond imagination until a few centuries ago, and their connection with disease wasn’t established till a scant 100 years ago. Although the microscope was invented in 1674, it took 200 years more for scientists to discover its use in isolating and identifying specific microbes of particular disease. Only then could public health campaigns and sanitary engineering join forces in eradicating ancient and recurring enteric diseases, at least in developed countries of the world. 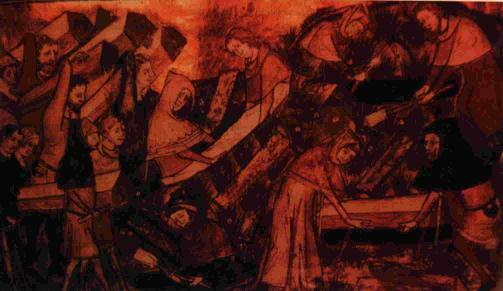 This 14th Century woodcut depicts the sorrow of medieval people as they begin burying their dead. Cleaning Up: From archeology we learn that various ancient civilizations began to develop rudimentary plumbing. Evidence has turned up of a positive flushing water closet used by the fabled King Minos of Crete back around 1700 B.C. The Sea Kings of Crete were renowned for their extravagant bathrooms, running hot and cold water systems, and fountains constructed with fabulous jewels and workings of gold and silver. Just a few months ago, a colorful public latrine dating to the 4th century B.C. was unearthed on the Aegean island of Amorgos. The 7’x 5′ structure resembles a little Greek temple. Topped with a stone roof, the interior walls decorated in red, yellow and green plaster, it served a gymnasium a short distance away. The building accommodated four people seated on two marble benches. Running water flushed the wastes away, probably along an open ditch at the users’ feet. Ancient water supply and sewerage systems – along with various kinds of luxury plumbing for the nobility – also have been discovered m early centers of civilization such as Cartage, Athens and Jerusalem as well. But it was the Roman Empire of biblical times that reigns supreme, by historical standards, in cleanliness, sanitation and water supply. The Romans built huge aqueducts conveying millions of gallons of water daily, magnificent public baths and remarkable sewer systems – one of which, the Cloaca Maxima, is still in use. Rome spread its plumbing technology throughout many of its far-flung territories as well. Yet, while we may rightfully marvel at the Roman legacy in plumbing, it should be noted that they were motivated by concerns of esthetics, comfort and convenience. They understood very well that bringing fresh water to the masses and disposing of waste made for a more pleasant way of life, but there is little evidence they understood the connection with disease control. Bursting Rome’s Bubble: In fact, the magnificence great city-state diminishes quite a bit when its plumbing systems come under closer scrutiny. Rome sprang up in haphazard fashion, a town of crooked, narrow streets and squalid houses. In its heyday, Rome had a population of over one million, and waste disposal was a definite problem. A luxury toilet in the private houses of the well-to-do was a small, oblong hole in the floor, without a seat – similar to toilets that prevail in the Far East and other sections of the world even today. A vertical drain connected the toilet to a cesspool below. In public latrines, a communal bucket of salt water stood close by in which rested a long stick with a sponge tied to one end. The user would cleanse his person with the spongy end and return the stick to the water for the next one to use. The stick later evolved into the shape of a hockey stick, and the source for the expression “getting hold of the wrong end of the stick.” It also provided an excellent medium for passing along bacteria and the assorted diseases they engendered. Decline & Fall: Though the Roman Empire would last until the6th century A.D., its fall was preceded by centuries of gradual decay, conflict and unrest. Ironically, some historians suggest that the Roman plumberi (plumbers) may have played a significant role in the downfall due to their extensive use of lead. So prized was the craftsmanship of these plumberi that in lieu of present – day status symbols like a Rolls Royce or Porsche, our Roman ancestors boasted of lead pipes in their houses, especially those imprinted with the plumber’s name (usually female, by the way), and that of the building owner. So bad was the “Black Death,” the Great Fire of London in I 666 can be viewed as a blessing in disguise. Though it killed thousands of people, the holocaust also consumed garbage, muck and black rats, effectively ending the plague. The summer of the first Crusade in 1090 was extraordinarily hot as the ill-prepared and rag-tag “army” of men and camp followers went to war with little more than the clothes on their backs-confident that the Lord would provide for their needs in such a holy cause. They denuded the land of trees and bushes in the quest for nourishment. Hampered by lack of fresh water and contaminated containers, they trudged along to their destiny, relieving themselves along the wayside or in the fields. Typhus fever is another disease born of bad sanitation. It has come under many headings, including “jail fever” or “ship fever,” because it is so common among men in pent-up, putrid surroundings. Transmitted by lice that dwell in human feces, the disease is highly contagious. Ten years later, Victoria’s son, Edward, almost died from the disease. A plumber traced the contamination to the lines of a newly-installed water closet and fixed the problem. Edward, the Prince of Wales, was very grateful to the plumber. Word spread of this episode and is thought to have hastened the acceptance of the indoor water closet in England. Mary Maflon was a cook for the moneyed set of New York State; her specialty was homemade ice cream. Officially, she infected 53 people – with three deaths – before she was tracked down. Unofficially, she is blamed for some 1,400 cases that occurred in 1903 in Ithaca, where she worked for several families. Never sick herself, it took a lot of persuasion by authorities to convince her that she was a carrier of the disease. Health authorities quarantined her once, let her go, then quarantined her for the rest of her life when another outbreak occurred. The Cholera Story: The bad news is that another waterborne disease, cholera, has proven one of history’s most virulent killers. The good news is that it was through cholera epidemics that epidemiologists finally discovered the link between sanitation and public health, which provided the impetus for modem water and sewage systems. With 20th – century smugness, we know cholera is caused by ingesting water, food or any other material contaminated by the feces of a cholera victim. Casual contact with a contaminated chamber pot, soiled clothing or bedding, etc., might be all that’s required. The disease is stunning in its rapidity. The onset of extreme diarrhea, sharp muscular cramps, vomiting and fever, and then death – all can transpire within 12-48 hours. In the 19th century cholera became the world’s first truly global disease in a series of epidemics that proved to be a watershed for the history of plumbing. Festering along the Ganges River in India for centuries, the disease broke out in Calcutta in 1817 with grand – scale results. India’s traditional, great Kumbh festival at Hardwar in the Upper Ganges triggered the outbreak. The festival lasts three months, drawing pilgrims from all over the country. Those from the Lower Bengal brought the disease with them as they shared the polluted water of the Ganges and the open, crowded camps on its banks. When the festival was over, they carried cholera back to their homes in other parts of India. There is no reliable evidence of how many Indians perished during that epidemic, but the British army counted 10,000 fatalities among its imperial troops. Based on those numbers,, it’s almost certain that at least hundreds of thousands of natives must have fallen victim across that vast land. Riots frequently broke out as friends and relatives rallied against the forced isolation of new arrivals by ship or steamboat. The ailment seemed capable of penetrating any quarantine of harbor or city. It chose its victims erratically, with terrifying suddenness, and with gross and grotesque results. 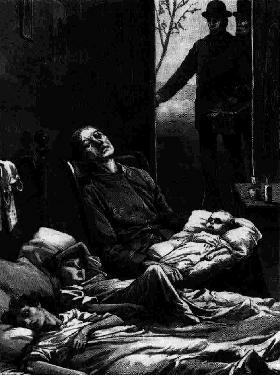 The worldwide cholera epidemic was aided by the Industrial Revolution and the accompanying growth of urban tenements and slums. There was little or no provision at all for cesspools or fresh water supplies. Tenements rose several stories high, but cesspools were only on the ground floor with no clear access to sewers or indoor running water. It didn’t make much difference, because until the 1840s a sewer was simply an elongated cesspool with an overflow at one end. “Night men” had to climb into the morass and shovel the filth and mire out by hand. In most cases, barrels filled with excrement were discharged outside, or contents of chamber pots flung from open windows – if there were any – to the streets below. Cholera first hit England through the town of Sunderland, on October 26, 1831. One William Sproat died that day from the disease, though nobody wanted to admit it. Merchants and officials found plenty of reasons to rationalize away a prospective 40 day maritime quarantine of the ports. England was reaping the profits of the Industrial Revolution. and a quarantine of ships would be catastrophic for the textile industry. At any rate, the medical profession held that cholera wasn’t contagious. Public health administration was in its infancy, and so disorganized that the leading doctor didn’t know there were two infected houses only a short distance away from each other. He learned of the “coincidence” three months later. 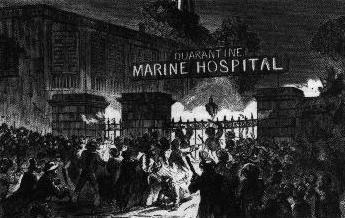 Cholera entered New York through infected ships. City people started clogging the roads in an exit to the countryside. On June 29, 1832, the governor ordered a day of fasting and prayers – the traditional response by government to treating the disease. After July 4, there was a daily cholera report. Some doctors flatly declared that cholera was indeed epidemic in New York, but more people sided with banker John Pintard that this “officious report” was an “impertinent interference” with the Board of Health. The banker incredulously asked if the physicians had any idea what such an announcement would do to the city’s business. Visitors were struck by the silence of New York’s streets, with their unaccustomed cleanliness and strewn with chloride of lime (the usual remedy for foul-smelling garbage). Even on Broadway, passersby were so few that a man on horseback was a curiosity. One young woman recalled seeing tufts of grass growing in the little-used thoroughfares. Steadfast Ignorance: The eminent Dr. John Snow demonstrated how cases of cholera that broke out in a district of central London could all be traced to a single source of contaminated drinking water. Sixteen years later Snow would win a 30,000 franc prize by the Institute of France for his theory that cholera was waterborne and taken into the system by mouth. But Snow’s original work received little attention from the medical profession. He was attacked at the weakest point – that he could not identify the nature of the “poison” in the water. By the end of the first cholera epidemic, the relationship between disease and dirty, ill – drained parts of town was rather well established. This should have spurred sanitary reform. But little action followed. When the second cholera epidemic hit England in 1854, Snow described it as “the most terrible outbreak of cholera which ever occurred in this kingdom.” At least it provided him with an opportunity to test his theory. By charting the incidence of the disease, he showed that over 500 cases occurred within 10 days over a radius of some 250 yards centered on London’s Broad Street. He looked for some poison which he believed came from the excreta of cholera patients and swallowed by the new victims. A common factor was their use of water that had been polluted with sewage. Snow had traced the pipelines of various water companies and showed that one was infected by cholera. The immunity enjoyed by the wealthy was short-lived, however. The open sewers of the poor sections eventually leached into the ground and seeped into wells, or ran along channels into the rivers that supplied drinking water for whole towns and cities. Once the rich and the movers and shakers of society began to get sick, government reform began.